Pavers can bring a distinctive texture to your property that can be appreciated by all. Whether it's a walkway, patio, or driveway - brickpavers are the focal point of your landscape. A well constructed retaining wall presents a clean, formal look. It can take a garden area or landscape bed to new heights. We are proud to use pavers and block wall materials from the best manufacturers on the market - Oaks and Unilock. 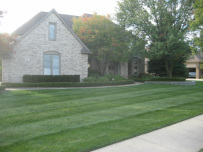 We can custom tailor a landscape maintenance package specific to your property, keeping in mind your budget and needs. We specialize in a full season's maintenance - starting with annual flowers, to bush trimming, to topdressing your mulch beds, to cleaning up the perennials as fall approaches. From existing landscape projects that are being worked on, to new construction projects - irrigation work is usually involved. We have plenty of experience in reworking systems to fit a new landscape bed, right up to a full installation on a property. For our maintenance clients, we are happy to provide service for spring start-ups, small repairs, and winter shut downs. After the snow melts and the spring rain stops, we are the first ones out in the sunshine cleaning up the properties of any debris that may have accumulated over the winter. Let us get your property kick started for summer with a full spring clean up. Then, as the summer begins to taper off into colder weather, allow us to take care of cleaning up the leaves. We have the right equipment and the ability to dispose of as many leaves as your property can produce. Flowers add a wonderful touch of color to any landscape. Whether you would like to plant a couple of small annual flower beds or a couple dozen custom flower pots, we can help with that task. We have plenty of experience in helping clients choose the right kind of annual flower for their area. From low maintenance to a show piece flower pot, we're happy to provide plenty of options.